It’s been a summer of artistic exploration for local children at the Averitt Center for the Arts, and many of them have learned the art of collage. Composed of fragments of found imagery from magazines, books and fabric, collage is an art that reorganizes these elements into new, startling compositions. 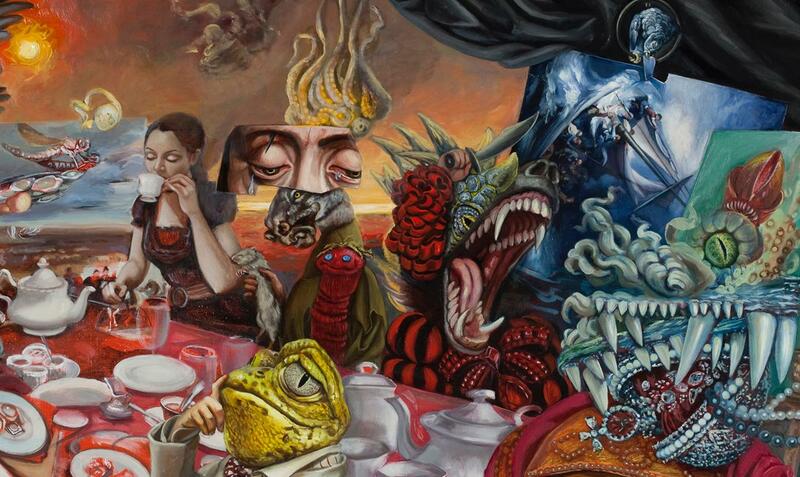 Carrie Ann Baade is a master of the technique, and her exhibit currently on display at the Averitt Center is a fine example of how “child’s play” can be elevated to high art. Originally from Louisiana, Baade’s study of art took her to Delaware, Chicago and as far as Italy while gathering skills in the classical techniques of oil painting and composition. Seeking to bring a contemporary element to her classical skills, Baade introduced collage as a way to create her “drawings” from which she paints her final works. Interesting in themselves, some of the collage works are framed alongside images of their final paintings. But as interesting as the collages are, the eye cannot help but be drawn to the shimmering, full-scale paintings on display, lush with detail and color, begging for prolonged study. A great student of mythology and the narrative traditions of painting, Baade is telling us a story in each fractured, layered work. “Triumph of Divine Love: The Eternal Mother,” for example, blends bits of Renaissance masterwork by Botticelli and Rubens with nature symbolism and Surrealism, expressing a new icon of the great mother of creation. The most ambitious work in the exhibit is “Allegory of Bad Government,” depicting a chaotic tea party populated by figures that embody such foibles as Cruelty, Greed, War and Hate. Based on a mural by early Renaissance artist Lorenzetti, Baade internalizes the symbolism to depict an allegory of the governance of the self. Carefully composed, all the elements in her paintings are infused with meaning. Many of the works are for sale and would make stunning additions to any collection. Drop by the Averitt Center, enjoy the cool air, and spend some time listening to these gorgeous creations.